Most people wouldn’t have seen it, but it instantly caught my eye. I saw this (picture left) last week in Shanghai, on the corner of Shaanxi Lu and Huaihai Zhonglu. It’s an animated advertising hording, which as you can see was mostly black with a cartoon Penguin and the words “Welcome to”. The mirror writing gives away that the Pepsi logo is a reflection of a sign opposite, and is only noticeable in my photo. The Penguin wasn’t moving at all. I don’t think Rosemary had any idea why I suddenly stopped and whipped my camera out to photograph it. It’s a brand thing and a cultural thing. To a whole group of idealogues in the computer industry, the Penguin logo represents freedom, community, and control. All valuable things, in a world exponentially screaming out of understanding. Unfortunately, the logo also means that something had gone wrong with the hoarding. 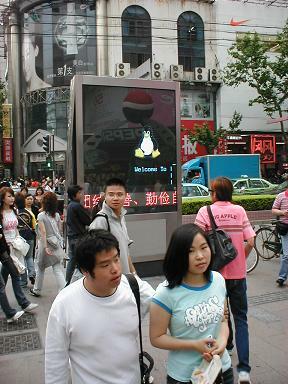 Not exactly a great advert for Linux, the computer “operating system” which the Penguin represents, to see it rebooting on one of the busiest intersections in China. But encouraging that it is being used as an embedded operating system there. We went past again a few minutes later, and animated adverts were spinning over the display once again. Optimistically, I thought maybe it was just starting up for the evening. However, I think I saw it a few days later in the day, and it runs all the time.